Crispy potato hash combined with canned salmon, salsa and sour cream make a scrumptious, easy meal. Place in a saucepan and cover with water. Heat to boiling, cover and then reduce heat to low. Cook until potatoes are tender about 10 minutes. Drain and set aside. Dice onion, garlic, celery and yellow bell pepper. Spray a skillet with non-stick spray, add vegetables and water and cook over medium heat until water has evaporated. Add potatoes and continue cooking, turning often until potatoes become lightly browned. Drain salmon and crumble into a mixing bowl. Add cilantro and pepper. Pour in potato mixture and stir to mix. Wipe out skillet, pour in oil and heat over medium-high until oil is hot. 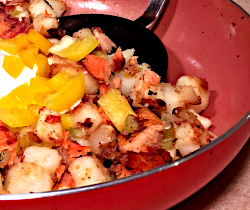 Pour potatoes and salmon into skillet. Cook over medium-high turning with a pancake turner until brown and crispy on both sides. Serve with salsa, sour cream, and remaining yellow bell pepper.